In the first part of the companion article, Craxford & sons, Fruiterers of Pentonville: Into Islington, we traced a branch of the Craxford family from its agricultural roots in rural Northamptonshire to its new home in Pentonville, north London. As we found, the family developed a long association with the greengrocery trade which was to continue with the Craxford name well into the 20th century. In this article, we will see how the business was perpetuated along the female line as well. Elements of these families proved to be quite mobile, staying at any given address for only short periods. 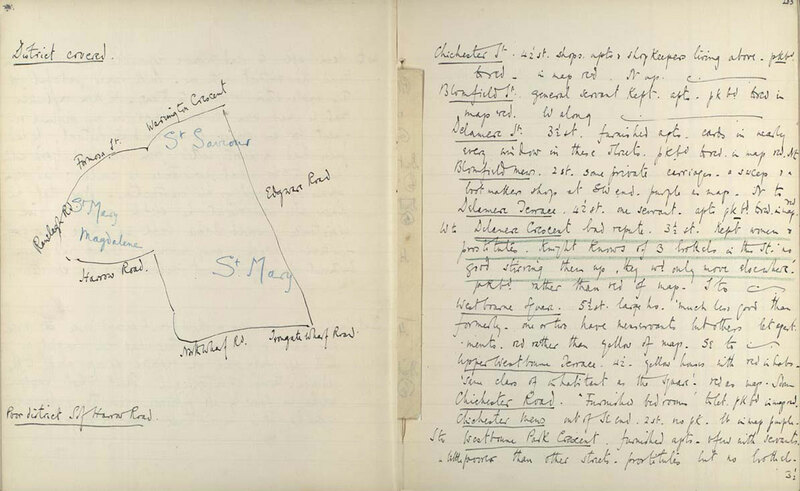 Whilst the decennial Victorian census returns for London have provided the major staging points, much further and sometimes unexpected information has been gained from the Parish Registers held by the London Metropolitan Archives (1). Little is known of the ancestry of John Hughes. The census return of 1841 suggests that he was aged 31 years but other clues indicate that he was at least ten years older than that. He met Louisa Ann Craxford, the daughter of William Craxford and Ann Easthop when the family were living in Pulteney Street. This was a relatively new housing development north of the Regent's Canal, Islington. 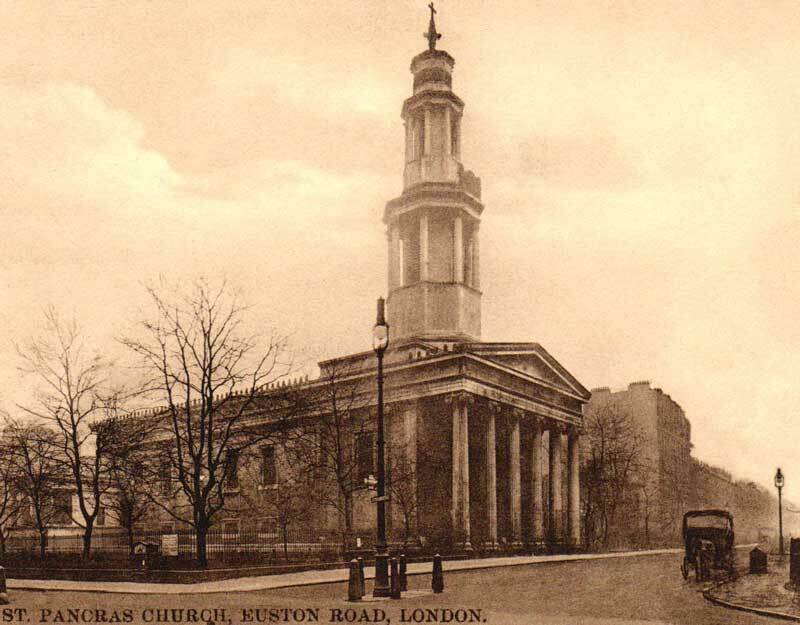 John and Louisa were married on December 12th 1824 at the Parish Church of St Pancras, a building on the Euston Road which had been consecrated barely two years before. They initially set up home in Tonbridge Street, St Pancras, where John worked as a baker. Their first son, William John, was born on September 7th 1825 and was baptised the following May at St Pancras Church. Within a year, John moved his family to Joseph Street, Islington and started trading as a greengrocer. In early 1829, Louisa became pregnant again, this time with twins. The babies were born on November 26th: a son, John and a daughter Louisa Ann. 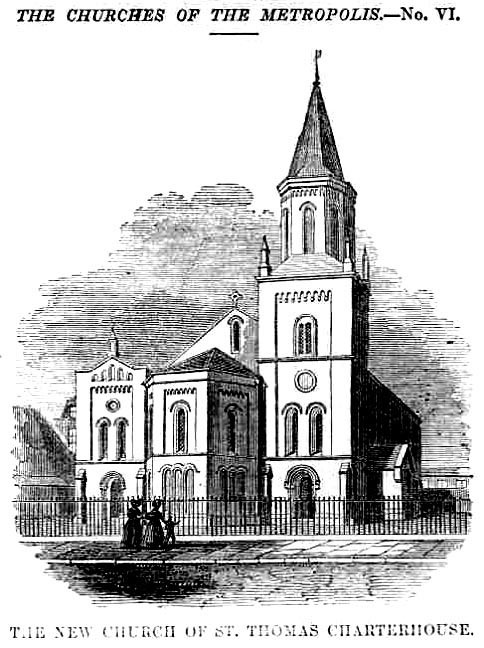 They were baptised together at St Mary's Church, Islington in August 1830. Sadly, John died during childhood. A further change of address to Red Lion Street, Clerkenwell followed where Louisa gave birth to her third son, Richard. He was baptised at St James Church, Clerkenwell, on October 13th 1833. By the time the 1841 census was conducted, the family had moved yet again, this time to 8 Suffolk Street, Pentonville when John re-established the business. In the same decade, John, too, passed away. For some time, Louisa continued to trade in Suffolk Street helped by her two sons. However the census of 1851 shows that they had moved to new premises in Copenhagen Street. She was listed as the proprietor in a trade directory of 1856 (3). The property was a stone's throw away from her parents' family home in Pulteney Street. This arrangement allowed her brother, Nathaniel, and his family to move in the opposite direction into the house at 8 Suffolk Street and take over the existing greengrocery and fruiterers business. 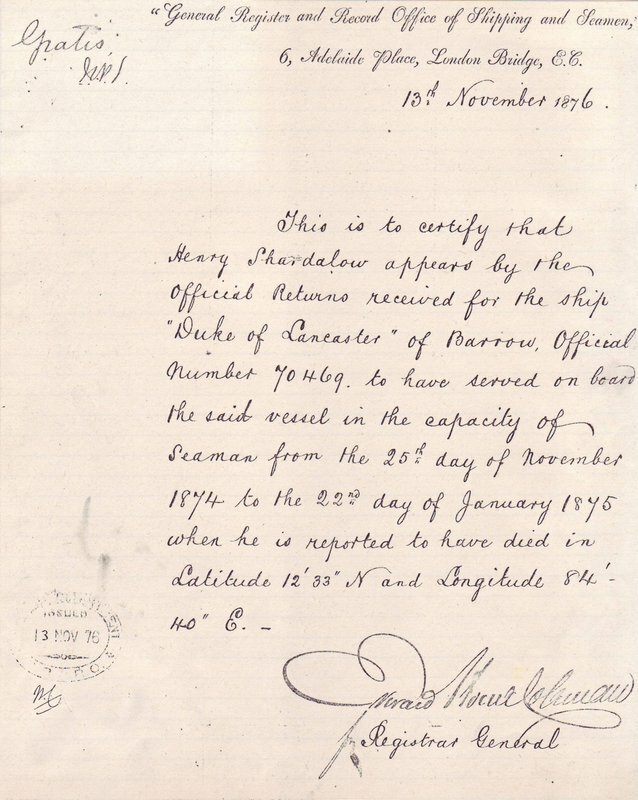 Drake Shardalow was born on October 31st 1797 in Norton Subcourse, a hamlet some nine miles south west of Great Yarmouth, Norfolk. His father, Francis, was a farmer. His somewhat unusual given name had come from his maternal grandmother, Elizabeth Drake. Nothing is known of his early years but sometime during the second decade of the 19th century, he started working as a carpenter and made the journey to London. He took up residence in Islington where he met Elizabeth Jackaman. 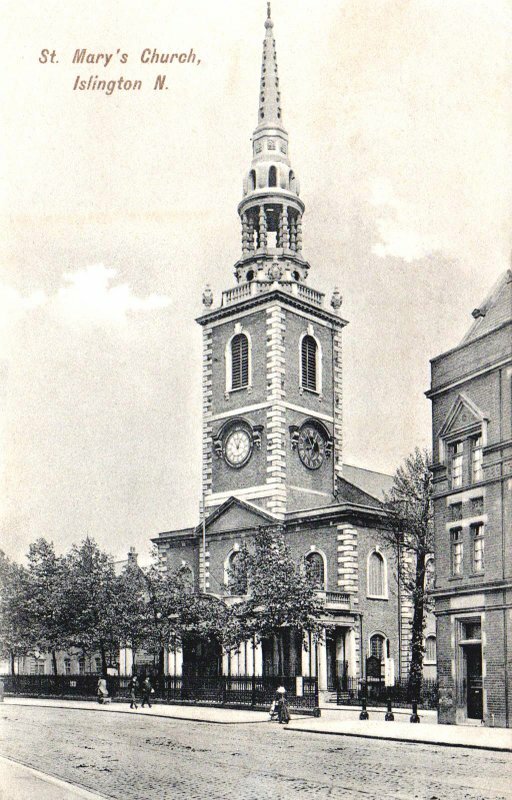 They were married at St James Church, Clerkenwell on March 22nd 1824. Immediately after the wedding, they set up home in Pulteney Street, close to where William and Martha Craxford lived. This was where their eldest son, William Francis, was born. Over the next fifteen years, they moved house on several occasions. In 1838, they were living in Mary Ann's Place, a small alley by the side of the old Finsbury Market, which was where their son Edward was born. The records suggest that they had seven more children (3 boys, 4 girls), although two, including Edward, died in infancy. By 1841, they had moved to Seabrook Place, a small terrace off White Lion Street in Pentonville. It was there that Elizabeth died. She was buried in Islington Cemetery in February 1842. Their second son, Henry Ezra, was destined to become a mariner. Drake did not remarry. By 1860, he had moved with his three daughters, Sarah Anne, Susannah and Emma, to Salisbury Street, Hoxton, North London. By coincidence, this house was midway between the City Workhouse (to the West) where Nathaniel James Craxford spent his final days and the Britannia Theatre (to the East) where the other branch of the London Craxfords held sway (see: The Craufords of Hoxton). William, Louisa Hughes' older son, did not remain in the family business. Although he was still working as a greengrocer at the time of his marriage, this was soon to change. He met Eliza, the daughter of whitesmith Thomas Allen, who lived in Chapel Street, Pentonville (A whitesmith is someone who works with soft metals such as tin or pewter. Their work is usually done "cold" rather than at a forge - Ed). 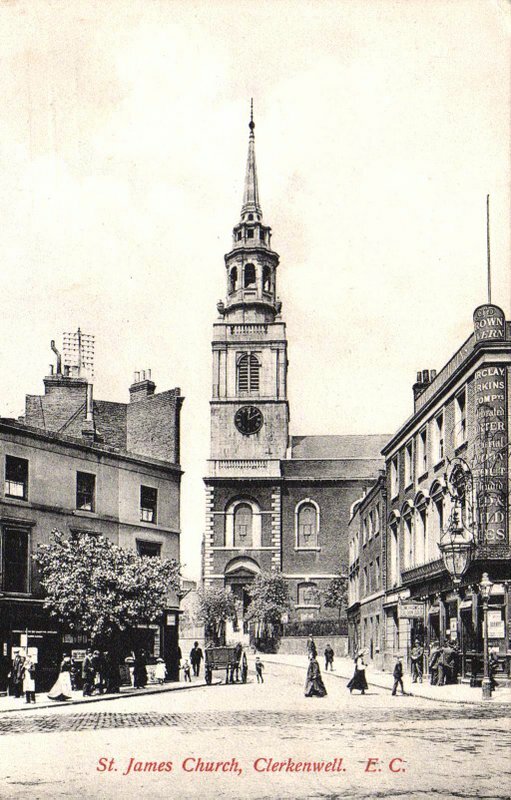 They were married at St James Church, Clerkenwell on October 29th 1846. They spent their early years at his mother's house in Copenhagen Street. During that time, they had two children, both baptised at St Mary's Church, Islington. First born daughter, Harriet, died in infancy in 1847. 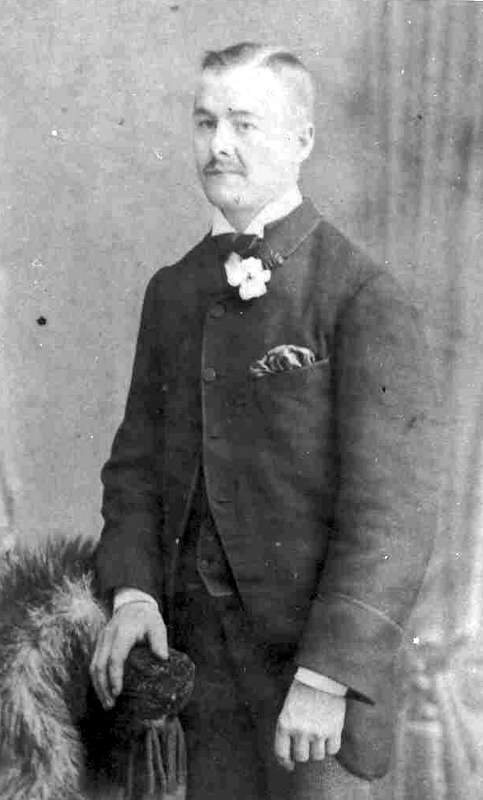 Their son, William Alfred Hughes, was born in March 1850. In 1853, William moved his family to Paddington, first taking up residence in Clarendon Terrace. Whilst there, Eliza become pregnant again and on September 27th 1854, their daughter Louisa was born. A clue to the decision to make the move from Islington may come from the parish register of St Mary on Paddington Green Church where Louisa was baptised which declares William to be a painter. He may have been lured by the opportunities generated by the area's rapid development. By the time of the 1861 census, the family were living in Warrington Gardens, a house which backed onto the open fields of Paddington Green to the north and west. William now had his own house decorating business and employed two men. At the beginning of the 19th century, Paddington was a thinly populated rural area on the Harrow Road to the north west of London (4, 5). The developed boundary of London had largely stopped in Marylebone on the eastern side of the Edgeware Road. Several proposed arterial transport routes added major impetus to the opening up of the area. The Grand Junction Canal was an existing major waterway system for the transportation of goods and raw materials running from Northamptonshire to the River Thames near Brentford. 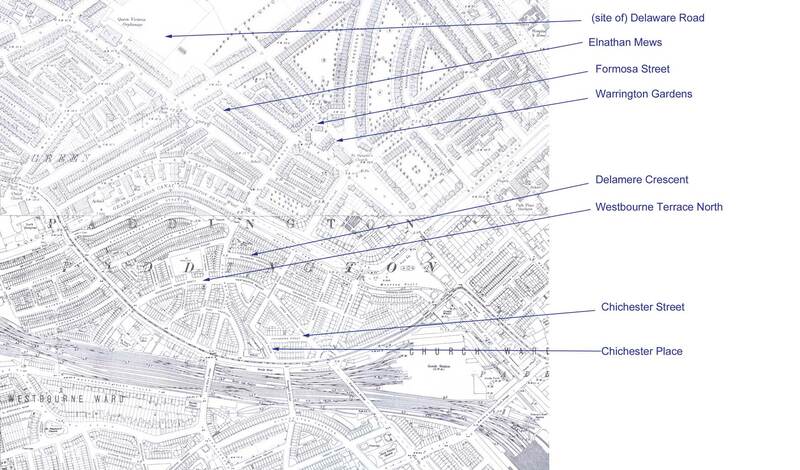 Conceived by Act of Parliament in 1793, a series of branch canals were planned and dug over the next thirty years. One of these, the Paddington arm, opened in 1801, divided the area in two and laid wharfs and warehouses along its banks. Much of the land in Paddington was under control of the church and the increased activities brought by the canal opened up the district to development and the influx of settlers. 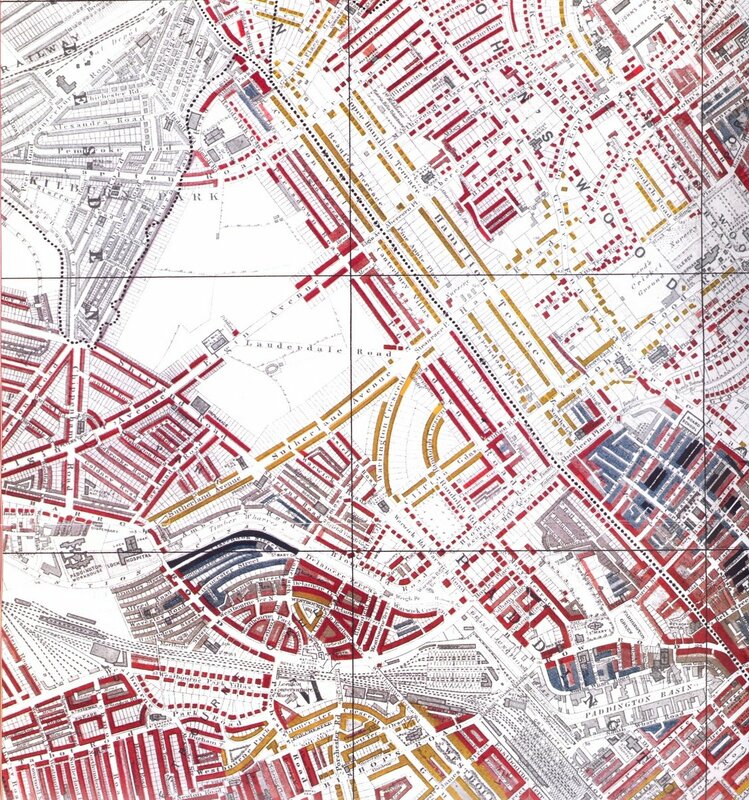 Plans for the north of the canal, initially called the Paddington Estate and ultimately becoming Maida Vale, were on a grand scale with long avenues and ringed with wide crescents. Houses were to be large, detached, stuccoed and in an Italianate style. Progress in the first half of the century was slow but accelerated in the 1850s. Building quickened in the second half of the century leading to a greater mix of housing types and higher density in some areas. Maida Vale was considered wealthy and upper middle class. The area also became noted for its influx of Jewish residents where, in the 1880s, they formed up to 20% of the residents. By the 1890s many of the first purpose built apartment blocks in London appeared along the Edgeware Road. Given their proximity, it is no surprise that the two families would have known each other and that their offspring would have played together during childhood. On November 14th 1854, Henry Ezra Shardalow married Louisa Ann Hughes at St Mary's Church, Islington. The ceremony was witnessed by his sister, Sarah Ann and her brother, William. At the time of the wedding, they were living with her mother in Copenhagen Street. There was a considerable delay before they started their own family, presumably because of Henry's long absences at sea. 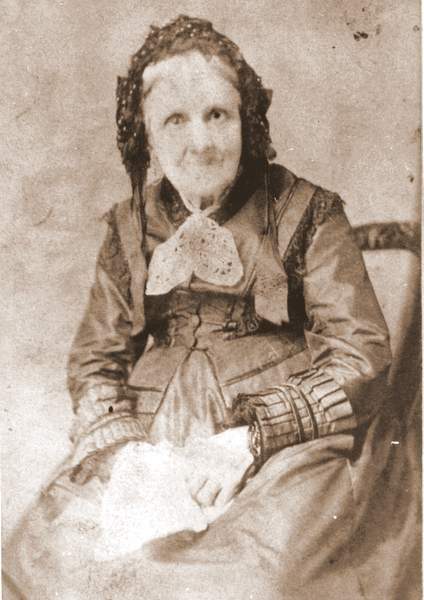 Louisa became pregnant towards the end of 1860. When the 1861 census was conducted (Sunday, April 7th) she was registered as living with her aunt, Sarah Hughes, at Brewer Street, Clerkenwell. About the same time, her daughter, Louisa Ann, was born, but sadly died six weeks later. 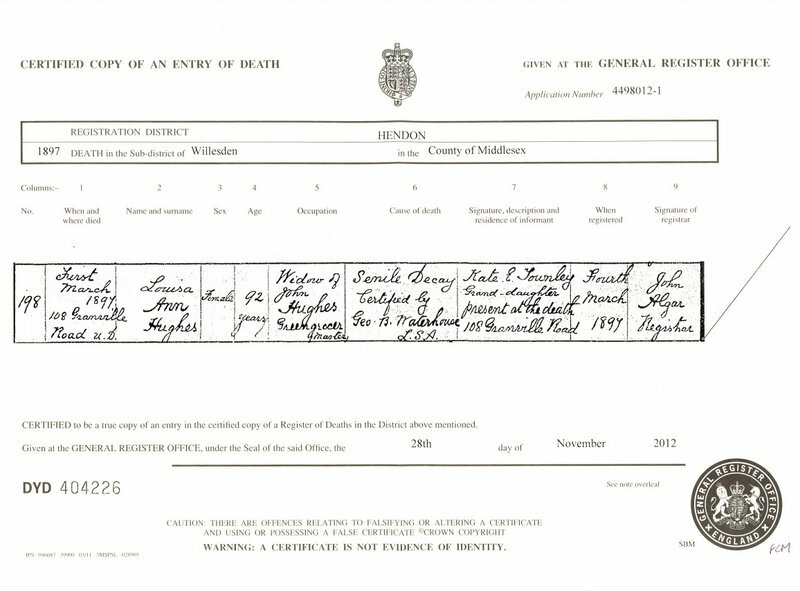 Their first son, William Henry, was born on May 31st 1862 and baptised at St Thomas Charterhouse, Goswell Road in November. 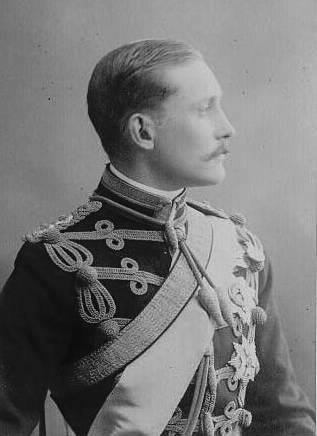 Second son, Albert George, was born in September 1865. 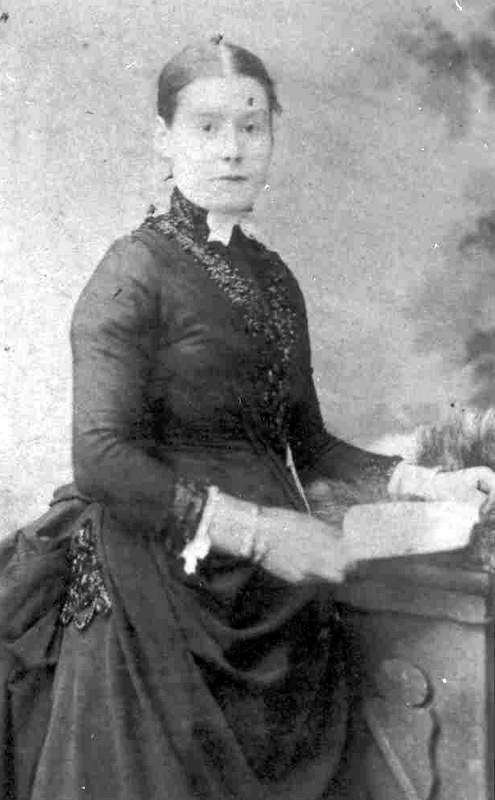 Daughter Eliza Kate followed in October 1867. In 1871, Louisa and her three children were resident in an apartment at 14 Hatfield Street in the St Luke district of Finsbury. Louisa was earning money as a needlewoman. Over a period of twelve months, tragedy struck the family three times. Firstly, her father in law, Drake Shardalow died on August 28th 1876. He had returned to Islington after his daughters had gone their separate ways. He was aged 79 years. After his death, Louisa moved back to Pulteney Street to be near her mother. Then in November 1876, Louisa received a letter notifying her of her husband, Henry's death at sea. This had happened eighteen months before on January 22nd 1875, when his ship, the barque "Duke of Lancaster" had been sailing in the Bay of Bengal, Indian Ocean. Around Christmas the same year, Louisa became ill with a chest infection. Her condition deteriorated and she died on January 22nd 1877. She was 48 years old. Her brother, Nathaniel James Craxford's second wife Eliza Osborn was with her when she died. She was buried in Islington Cemetery the same month. Of their children, nothing is known of the fate of William Henry Shardalow. 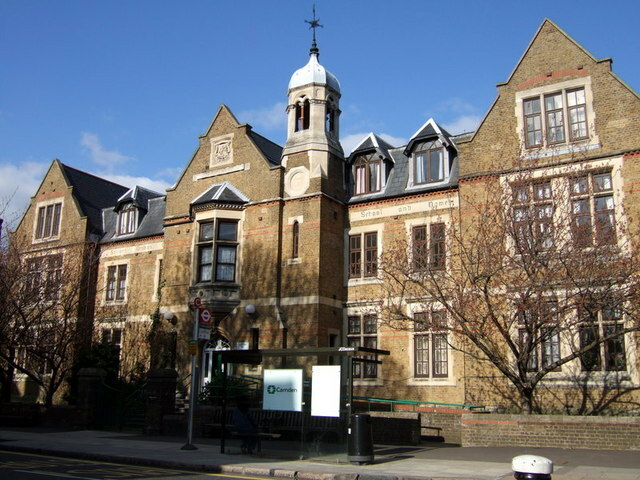 In 1878, Albert George became a voluntary care scholar at Milton Industrial School for Boys, a residential school in Gravesend, Kent whilst his sister, Eliza Kate, became an inmate at the Sailors Orphan Girls School and Home in Hampstead. Kate remained there until September 22nd 1883 when she was discharged to become housemaid at the family home of Catherine Ibach of Surbiton Hill Park. Albert Ibach was a stockbroker. The Sailors' Orphans Girls School and Home (7, 8) had been established as an institution in the 1820s and had offices at 77 Cornhill in the City. It transferred to building at 116 FitzJohns Avenue, Hampstead which was was opened in July 1869 by Prince Arthur, Duke of Connaught (Queen Victoria's third son). Later, it changed its name to the Royal Sailors Daughters School and Home. In 1957, the building was taken over by the Sailors' Families Society which had been founded in Hull in 1821. In the 1960s, the home was closed and the remaining inmates were transferred to Hull. The building has since been redeveloped by the local council, renamed Munro House, and has been reopened as apartments and sheltered accommodation. 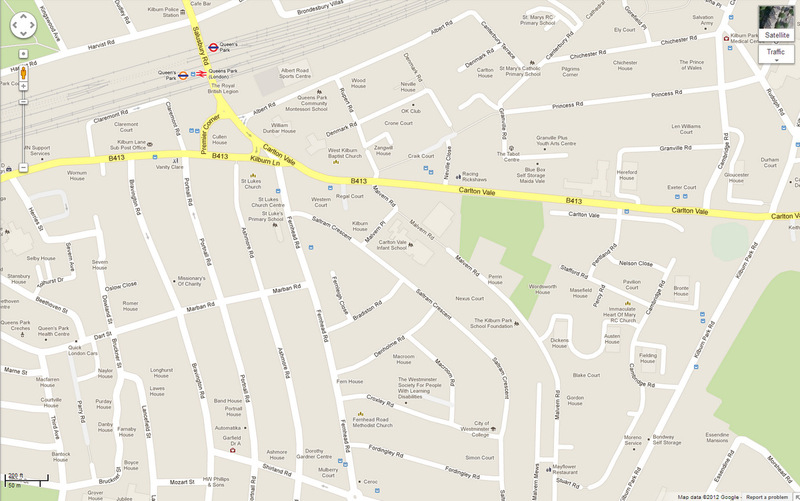 The area south of the Grand Junction Canal was Westbourne Green (12, 13). It remained rural until 1820 with a number of large houses and farms. At the beginning of the century, the actress Sarah Siddons lived for a time at Westbourne Farm. The original plans were for properties similar to but somewhat smaller than those on the northern bank of the canal, leading to the area being called Little Venice. Westbourne Green was bisected in the 1830s by the construction of the Great Western Railway and the area to the south of the line became known as Westbournia. In the 1850s, villas on Westbourne Grove (its main thoroughfare) gave way to shops. In 1863, William Whiteley opened one of the first department stores in the capital and Westbourne Grove became renowned as the Bond Street of the west. This increasing commercial prosperity led to a rapid decline in social conditions in the streets north of the railway. As the 19th century progressed, what reputation the Paddington estate may once have had as a desirable place of residence gradually declined. On the west side of Ranelagh Road, houses were sublet to weekly tenants leading to overcrowding with as many as 3.5 people to a room. Surveys in the second half of the century regularly showed 16 or more people in each house. Charles Booth (1840-1916) (14), who was to be instrumental in the development and introduction of the Old Age Pension at the beginning of the 20th century, spent several years investigating conditions and drawing up the celebrated Poverty Maps of London (15). These maps are colour coded to indicate the circumstances of the streets under review. On Monday December 12th 1898 he took a walking tour around the area with Police Inspector Knight. In his opening remarks, he noted the area between the railway and the canal as "a deteriorating red (Middle class - well-to-do) district." His description of Chichester Street and Road reads as follows (16): "Chichester St. 4½ st(ory) shops, apts and shopkeepers living above. Chichester Road: Furnished bedrooms to let. pkbd (pink barred: Fairly comfortable - good ordinary earnings) to red. in map red". He continued to Delamere Crescent where he saw: "Bad repute. 3½ story Kept women and prostitutes. Knight knows of 3 brothels in this street. 'No good stirring them up they would only move elsewhere." He summed the area up in his closing remarks as "Red to pink barred district w of Paddinghton Green to Ranelagh Road deterioratying. More pink barred than red. Better houses than people. Good admixture of prostitutes. Brothels in Delamere Crescent. poorish mews"
Westbourne Terrace North is mentioned briefly in the walk he made on the other side of Ranelagh Road in January 1899. (17). 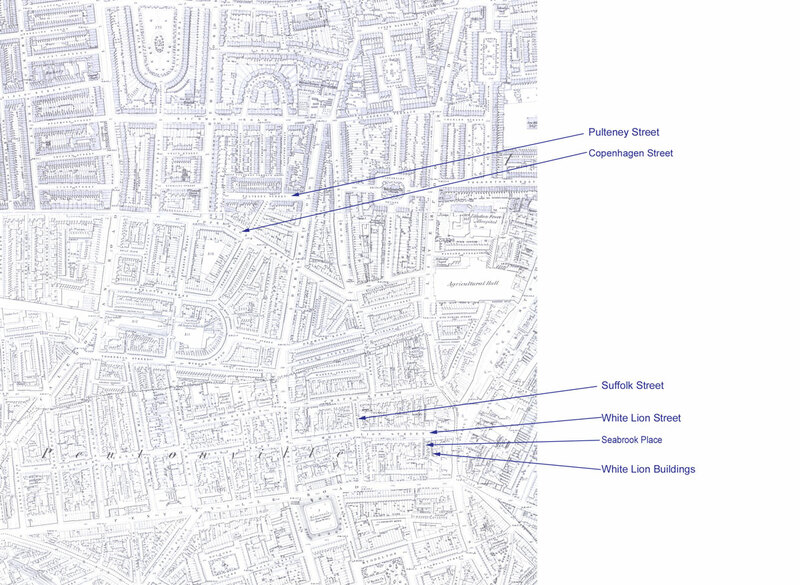 Generally the area was described as poor mixed streets (purple) although Westbourne Terrace North achieves "pink to pink barred: Shops keeping a general servant". Meanwhile, sometime in the late 1860s, William and Eliza Hughes moved the family again again. 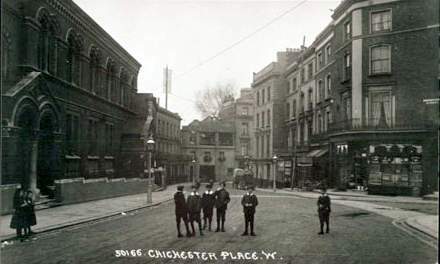 This time they took premises at 3 Chichester Place which they opened as a greengrocer's shop. It was there where William died. In 1871, Eliza was running the business, aided by her son William Alfred. Nothing more is known of her after the census of that year. William Alfred Hughes married 30 year old Elizabeth Diana Smither, the daughter of farmer George Smither, at Holy Trinity Church, Paddington on July 19th 1874. His sister Louisa acted as one of the witnesses. The couple continued living at Chichester Place. Their son, William Tom, was baptised on July 15th 1877. In December the following year, Louisa Hughes married engineer Noah Harley Willey at Holy Trinity Church. Her brother witnessed the ceremony. They set up home in St Mary Stratford-le-Bow where their first child, Harley, was born. 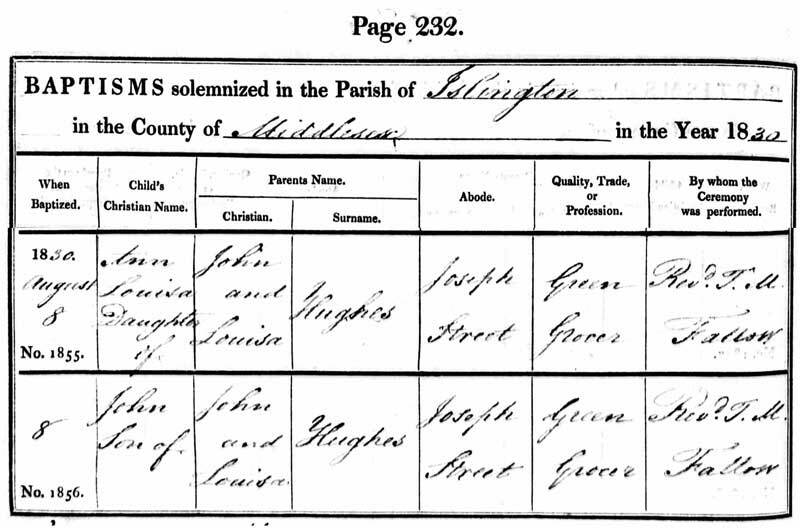 By the census of 1881, now well into her 70s, William Alfred's grandmother, Louisa Ann (Craxford) Hughes, came to live, presumably to help with the domestic chores and look after the young child. It is not known how long she stayed, for she had moved again by 1891. Elizabeth died in the autumn of 1897. Two years later, William was to marry again. His second wife was Susan (born 1861), the daughter of William Skinner, a carpenter who was originally from Devon. Prior to the marriage her family were living in Shirland Road, Paddington, and she worked as a bookkeeper. There were no children. In due time, William Tom joined his father as an assistant in the greengrocery shop. 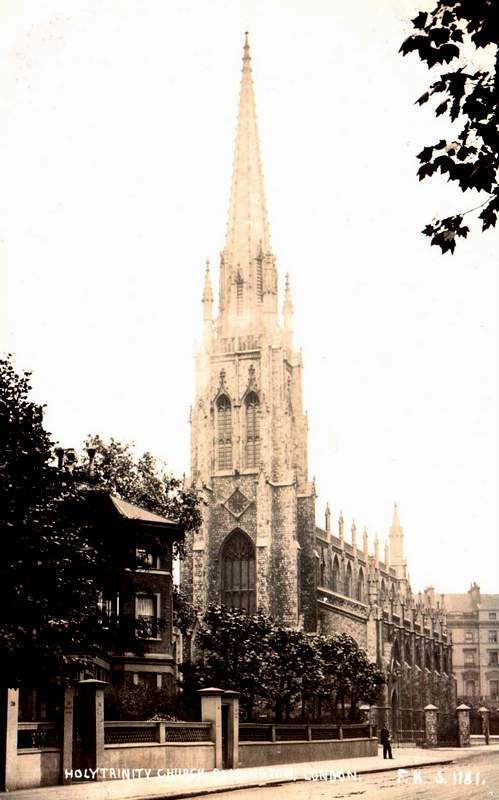 On June 3rd 1900, he married Amy, the daughter of Plasterer James Fleming at Holy Trinity Church Paddington. After the service, they moved to an apartment a few doors away at 8 Chichester Place. At the same time, the elder William's wife's widower father, William Skinner and her niece, Louisa Skinner, moved in to share the accommodation at No. 3. William Alfred Hughes died in the winter of 1910. Susan continued to live in the apartment over the shop with her elderly father. William Tom Hughes continued to manage the greengrocery business with his wife Amy until 1912, after which time nothing further is known of them. No-one knows for certain how or when Albert Shardalow became a shopkeeper. He was twelve years of age when his mother died in 1877. The place he was sent to, Milton Industrial School, had been opened two years previously in Parrock Hall, a damp and draughty old mansion on the outskirts of Gravesend. It was certified to hold 150 residents. In a curious coincidence, given what was to follow, one of the schoolmasters on the staff was a Mr Delamere. It seems likely that Albert would have left the school in the early 1880s - at the latest by his eighteenth birthday. In 1891, he was living in Peel Road, Kilburn, with his sister, Kate and his grandmother Louisa Ann Hughes. This address was about a mile and a half to the north west of Chichester Place, the other side of Paddington Recreation Ground. Its position can be seen on this detail from the London Poverty Map. In the census of that year Albert's occupation is described as 'greengrocer shopboy'. It is not known when Louisa left her grandson William Hughes' home but the presumption is that she moved to Kilburn shortly after the 1881 census was taken to look after her young Shardalow charges. It is also possible that Louisa took the opportunity to introduce Albert to his cousin and to encourage him to work for William in his greengrocery shop. There is a story that Albert was sent to Canada during the 1880s. He is said to have spent five years there before his return to England. This is as yet unsubstantiated but is firmly part of the family folklore. In any event, Albert had a hat which he called his 'Canada hat' which absolutely no-one was allowed to touch, let alone wear. Albert was the first of the siblings to marry. His bride was Ellen Amelia Stone, the daughter of Emmanuel Stone. She had been born in Andover, Hampshire in 1873. At the time of the wedding, she was living nearby in Hayden Park Road but then joined Albert in Peel Road. Their first son was born there and baptised at St Luke's Church, Kilburn. They were to move to 44 Westbourne Terrace North, which lay between Westbury Road and Ranelagh Road and just a short walk away from Chichester Place. There, Albert established his own greengrocery shop. Sister Kate went with them. Between 1893 and 1915, Albert and Ellen had nine children - four sons and five daughters. Second daughter, Louisa Ann, died before her first birthday. Kate Shardalow married wheelwright and coach painter Percy Ronald Townley at St Paul's Church, Paddington on December 20th 1896. The ceremony was witnessed by their respective brothers, Albert Shardalow and Charles Townley. For a short time they continued to live at Westbourne Terrace. The following year, they moved on to Portnall Road, Kilburn where Kate became pregnant. Her daughter, Kate Elizabeth was born in September 1897. A second daughter, Gertrude Florence, followed in 1902. Louisa Ann Hughes moved from Peel Road to an apartment in a tenement building in Granville Road, Kilburn. It was there that she died, aged 92 years, on March 1st 1897. The cause of death was recorded as senile decay. 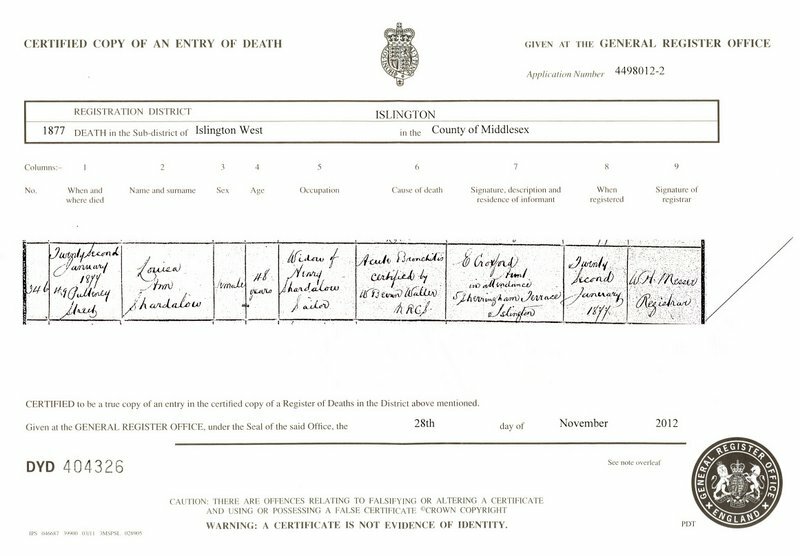 Kate was with her when she died and registered her death. A full list of references can be found at the end of Part 2.